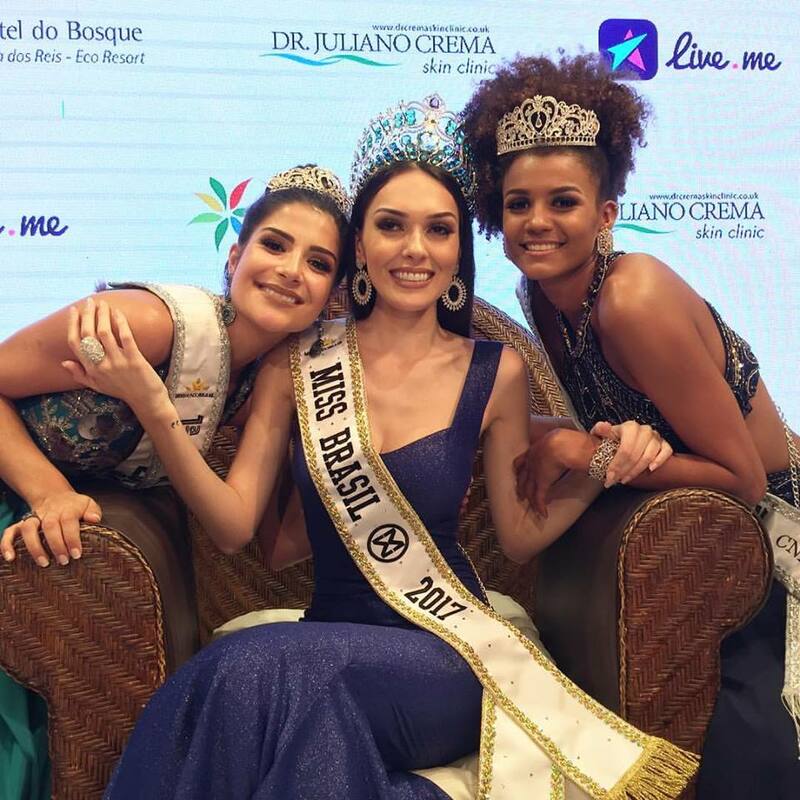 Her third time was the charm for Miss Rio de Janeiro, Gabrielle Vilela, who defeated 41 other beauties to win the Miss Brasil Mundo 2017 title at the Hotel do Bosque in Angra dos Reis. The crowd erupted with cheers of joy when it was announced that the hometown girl took home the title. Vilela is 26 years old and stands 1.72m tall. She was also the co-winner of the Beauty With A Purpose award with Miss Sao Paulo, Daniele Arruda. The first runner-up was Miss Mato Grosso, Barbara Reis, and the second runner-up was Miss Zona da Mata, Julia Horta. Miss Sao Paulo finished in fourth place. The top 6 were completed by Marcela Marques, Miss Grande Sao Paulo, and Miss Brasilia, Anna Lyssa Valim, who finished in 5th and 6th places respectively. The top 11 were completed by the delegates from Espirito Santo, Ilha dos Lobos, Minas Gerais, Para, Paraiba and SP Capital. The delegates from Circuito das Aguas (Talent winner), Grande Porto Allegre, Ilhabela, Jurere Internacional, Mato Grosso do Sul, Pantanal (MS), Santa Catarina and Sergipe made the 20. I love these girls so much! It was an honor to spend the week with them. Photos courtesy of Leonardo Rodrigues! They are all beautiful, but if the winner is really 26 she is to old for Miss World. When will BRAZIL STOP sending mature top of age limit girls to MISS world? Sancler was the last mw WINNER type they selected. The first RUNNER UP would have been a delight. BARBARA REIS could have easily WON top model at MISS world and taken the blue CROWN in China...i hope she tries again. If she is 26 she is too old for Miss World. You would think the judges would know that and the organiser of the contest and not allow her to enter.